It is difficult to say when the first Llanfyllin Show took place. There has been an annual Show of some type goingback possibly to the time of the visit of Charles l. in 1645 an occasion which was celebrated with horse racing on Cefn Bran. That was an isolated event, because it was not until after the Restoration that the next race meeting could be held. 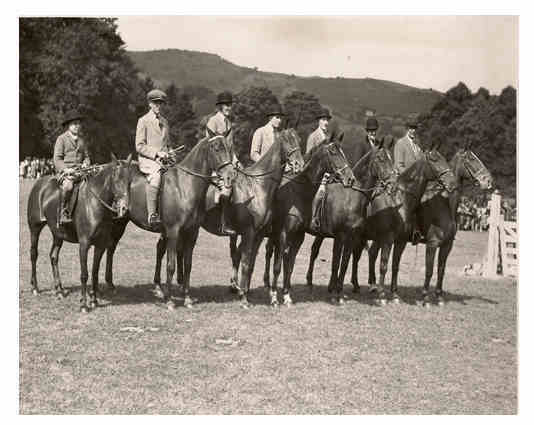 From that time forward, until they were transferred to Oswestry, the Llanfyllin races were a regular feature of the town’s life and their institution in honour of Charles l. was generally acknowledged. Even after their removal to Oswestry, some kind of event took place locally as recorded in a newspaper article dated 1803 that announced the races being held on 4th July. Stewards were listed as Sir Watkin Williams Wynn and David Evans. The Charter Fairs also attracted a number of Shows which took place on Penybryn and were often very rowdy affairs, by all accounts, leading to an eventual ban on dogs pulling carts! The first Show, of which any records survived, is the Agricultural Show of 1869, which took place under the presidency of Sir Watkin Williams Wynn. Four more Shows were staged in the years that followed but then there was a lapse until 1890 and even then the event did not become an annual one until 1906-7. The Horticultural Society was founded in 1888 when its first Show was held. It started in a small way when an argument developed between two gardeners, as to whose produce was the better. These two men were Mr Thomas Ellis, Pendref Mill, (the late Miss Ethel Ellis’ father) and Mr Ben Hughes, Coffee House. Following this it was decided to form a Horticultural Society and hold a Show where the produce could be judged officially. The Show was given the support of important local dignitries with the honorary secretaries at that first Show in 1888 being, J.M.Dugdale, Llwyn and John Lomax, Bodfach, with the trophies being presented by Dowager Lady Williams Wynn. In the afternoon Yeomanry Sports were run and prizes were awarded for the best flowers, vegetables and butter presumably putting an end to the local bickering. In 1889, to add some interest for people who were not interested in growing flowers and who were not farmers, it was decided to bring in an observatory hive of Carmolen bees from Australia. They were exhibited by H. Lewis, Oswestry. Both the Agricultural Show and the Horticultural Show were held on Bodfach fields that year. The District Agricultural Society held their first meeting at the Wynnsaty Hotel on Thursday 3rd May 1890 to consider the advisability of re-establishing the Society. A large number of farmers and many other interested people attended. Mr W A Pughe, solicitor, occupied the chair and explained that a Show had not been held in the district for 15 years and that a balance of £34.15s was standing to the credit of the Society in the local bank. After some discussion Mr John Lomax proposed, seconded by Mr Owen Jones “That this show be held this year and to take place annually during the last week in September.” This was put to the meeting and carried unanimously. It was proposed, seconded and carried without dissent, that Sir Watkin Williams Wynn and Mr J Marshall Dugdale be requested to act as president and vice-president. The Chairman stated that he had approached Mr Marshall Dugdale, who willingly gave his consent for the Show to be held on Llwyn Park. There were cheers from the floor! Mr W A Pughe was requested to act as Chairman of the General Committee. The next Chairman was Mr John Lomax who was in office for more than 20 years. From 1906 the two Shows amalgamated to become the Llanfyllin Agricultural and Horticultural Show. Sheep Dog Trials were introduced in 1912 when competitors declared Llwyn Maes, the best trials ground around. The Dugdale family on Llwyn ground. Major Dugdale is on the far right & Miss Rosetta Dugdale on the left. There was no Show during the years of WWI or WWII. However, during the Second World War “Victory Shows” were held at the Town Hall. This was a show of garden and horticultural produce which were then sold. The money realised was donated to the Red Cross. The only other year since, that no show was held was 1968, due to foot and mouth disease and in 2007 the Show Committee was forced to cancel the livestock competitions when the disease broke out once again. The innovations of recent years have been the Dog Show and Floral Art. The exciting Horse Races no longer take place. This was always the last event of the day and considered by most people to be the most exciting. Spectators who had stood outside the ring all day watching the events inside the ring now swapped places and all moved inside the ring for safety while the ground outside the ring became the race track. Bets were discretely placed, usually on the rider rather than the horses, as little was known about the horses’ form! Llanfyllin Agricultural & Horticultural Show still attracts many people, a large number of whom have moved away from the area but who return to Llanfyllin on Show Day each year to meet up with old friends and enjoy the activities. In the 1990s the Llanfyllin and District Young Farmers got involved with the organisation resulting in a new surge of enthusiasm aided probably by the loss of the County Show at Welshpool. 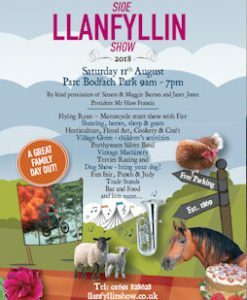 Let us hope that the Llanfyllin Show will survive for many years to come. 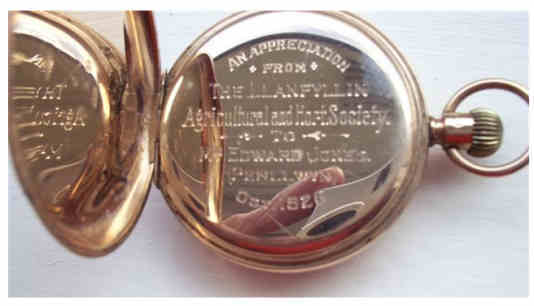 Gold Pocket Watch presented to Edward Jones in 1926, Chief Steward at Llanfyllin Show and Bailiff for the Dugdales at Penllwyn. The photo was supplied by his great grandson: Barry Jones, Penllwyn.